A 30-year-old female with a history of WPW and mitral valve repair presents to the emergency department with swelling, color change, pain, and numbness of her right 4th digit for two hours. She had been outside in the cold when her finger became painful and turned blue. She reports no trauma or previous episodes. She applied ice to the finger and felt that the pain and swelling improved. No other digits were affected on both the hands and feet. She denies ever being a smoker. Family history is significant for a brother with Raynaud’s phenomenon. Her ROS is negative otherwise. Constitutional: She is oriented to person, place, and time. She appears well-developed and well-nourished. No distress. Neck: Normal range of motion. Cardiovascular: Regular rate and rhythm. Intact distal pulses. Muskuloskeletal: Normal range of motion. She exhibits edema (4th finger right). She exhibits no tenderness or deformity. Neurological: She exhibits normal muscle tone. Skin: She is not diaphoretic. Ecchymosis of R 4th finger, spares finger tip. Fingertip is pink with normal capillary refill. Psychiatric: She has a normal mood and affect. Achenbach’s syndrome, or paroxysmal finger hematoma, is a rare, benign, self-limiting condition of spontaneous hemorrhage in the hands and fingers. It was first described by a physician named Walter Achenbach in 1955. It is usually described by patients as an abrupt onset of burning pain in one or more digits with associated symptoms including swelling, cyanosis, pallor, coldness, numbness, itching, and difficulty moving the affected digits. Coloration can range from pallor to blue, and typically affects the palmar aspect of the involved digit around the base or MCP joint. It can also be entirely painless. The index finger is most commonly involved, follow by the middle finger. Rare cases may involve the thumb. For unknown reasons AS more commonly affects the left hand. Diagnosis is made clinically and testing will be normal, including hematologic tests, coagulation studies, imaging, and vascular flow studies. Biopsy may show nonspecific signs including minor bleeding and inflammation. Symptoms will improve on their own but may take days to weeks to fully resolve, and it will often relapse. Middle-aged women are the most common patients who present with this rare syndrome. Achenbach’s syndrome is a diagnosis of exclusion, and therefore organic causes of pain and hemorrhage or bruising in a digit should first be excluded. Underlying coagulopathy, vascular insufficiency, and autoimmune causes are all within the differential and should be excluded when there is high enough suspicion. There are no consistent angiographic or radiographic findings, and there are no clear disease associations. Etiology may possibly be related to vascular fragility as occasional cases occur after minor trauma, however there is no evidence to support this definitively. Once a diagnosis is made by excluding other possible causes patients with this rare condition should be reassured of its benign nature. They should also be counseled about the likelihood of recurrence to prevent anxiety if they develop symptoms again. Our patient’s presentation was atypical in that she was younger than the usual presenting age and the 4th digit isn’t commonly affected in an isolated manner. The actual color changes were typical of AS in that they involved the more proximal part of the digit. For this patient, it was important to rule out a vascular cause of her symptoms given that she had a history of a dysrhythmogenic condition and a valve repair, both of which could predispose her to cardioembolic events resulting in arterial occlusion. Clinically her finger did not appear ischemic, and her cardiac exam was normal making this unlikely to be the case. Attempts to rewarm the finger further did not result in color change back to normal. Given the normal appearance and perfusion of the distal finger there was no concern for a vascular emergency. An x-ray of the finger was normal and ruled out fracture. The patient was provided with reassurance and sent home with return precautions and PCP follow-up. Ahmed Z et al. 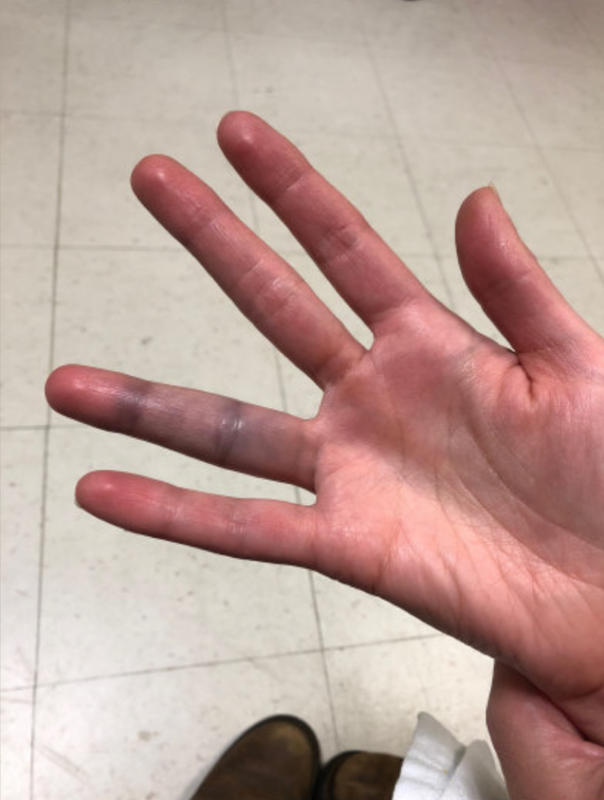 Painful Blue Finger – Achenbach’s Syndrome: Two Case Reports. EJVES Short Reports. 2018; 40:1-2. Frerix M, Richter K, Müller-Ladner U, Hermann W. Achenbach’s syndrome (paroxysmal finger hematoma) with capillaroscopic evidence of microhemorrhages. Arthritis Rheumatol. 2015; 67:1073. DOI: 10.1002/art.39003. Jiménez PR et al. Achenbach’s syndrome: Case report and systematic review of the literature. Rev Colomb Reumatol. 2017; 24:230–236. Takeuchi H, Uchida HA, Okuyama Y, et al. Acutely idiopathic blue fingers: a young man with Achenbach’s Syndrome. BMJ Case Rep. 2016. DOI:10.1136/bcr-2016-214491. Watchcorn RE et al. Paroxysmal purple palmar macules with a rare aetiology. Clinical and Experimental Dermatology. 2017; 42:561–563. doi: 10.1111/ced.13101. Yamamoto Y, Yamamoto S. Achenbach’s syndrome. New England Journal of Medicine. 2017; 376: 26. DOI: 10.1056/NEJMicm1610146. The patient is a 39-year-old female, G2P1, without significant PMH, who arrives in the critical care room from triage. She is lethargic with an undetectable blood pressure and a moderate amount of vaginal bleeding. A cordis was placed emergently and she received 2U pRBCs. Her mental status responded quickly to the transfusion, along with her systolic blood pressure. The first detectable blood pressure was captured in the 60’s and continued to steadily improve. During resuscitation, her husband tells you that they believe she is seven weeks pregnant based on her LMP, however, she has not had an evaluation or ultrasound yet during this pregnancy. She recently took an at-home pregnancy test that was positive. She had some vaginal spotting last week that resolved. She otherwise has no history of abnormal bleeding, but does report strong cramping during menstrual periods. No history of sexually transmitted infections. This episode of vaginal bleeding began this morning and was associated with moderate pain and abdominal cramping. She has been changing pads hourly to manage the vaginal bleeding; she reports blood clots but no passage of tissue. She otherwise reports some recent weakness and fatigue in addition to SOB and chills. Denies chest pain, back pain, urinary symptoms. Alert and oriented x3. Diaphoretic, anxious, pallor. External os dilated <5mm. Patient passing multiple large clots and copious bright red blood from cervical os on speculum exam. Cervical ectopic pregnancies represent less than 1% of all ectopic pregnancies. Prior dilatation and curettage, caesarean section and in vitro fertilization all increase risk for implantation of the blastocyst into the intracervical wall. According to one review, the incidence of cervical pregnancy is 0.1% among in vitro fertilization pregnancies. They can present with painful or painless vaginal bleeding. If detected early, cervical ectopic pregnancies can be treated similar to a tubal ectopic with methotrexate. If hemorrhaging, there is a high risk for maternal mortality and therefore a hysterectomy would be necessary to control bleeding. There may be some role for uterine artery embolization prior in an attempt to decrease bleeding and therefore decrease the likelihood for hysterectomy. Don’t forget to administer Rhogam if indicated. Incomplete abortion may also present with products of conception residing within the cervix. For this reason, it may be difficult to ascertain the difference between a spontaneous miscarriage versus cervical ectopic pregnancy. The ‘sliding scan’ on transvaginal ultrasound is seen when the gestational sac, in an intrauterine pregnancy that is aborting, slides against the endocervical canal. This sliding is not seen on a cervical ectopic pregnancy due to the implantation into the endocervical wall. The ultrasound was reviewed with radiology and OB/GYN specialists and the decision was made to administer Methotrexate. Due to the persistent vaginal bleeding, the patient was taken urgently to the OR for dilation and curettage. Intraoperative findings were consistent with an adherent mass arising from the anterior cervix. There was moderate active bleeding from the cervical os. The anterior lip of the cervix was injected with a solution of dilute vasopressin and was grasped with a single tooth tenaculum, with care not to disrupt the mass. A paracervical block was then performed with the dilute vasopressin. Figure of 8 sutures were placed at 3 and 9 o’clock and tied down to partially occlude the cervical branches of the uterine artery. There was minimal clot in the uterus. An 18F intrauterine foley balloon instilled with saline was placed to provide tamponade to the cervix. Intrauterine foley was removed on POD#2. She was discharged on POD#3. At her two-week outpatient follow-up appointment with OB/GYN, the patient had minimal pain and light bleeding. She was started on Depo-Provera to prevent pregnancy for six months due to the administration of MTX. Outpatient labwork trended her beta-HCG to zero. Samal SK and Rathod S. Cervical Ectopic Pregnancy. J Nat Sci Biol Med 2015 Jan-Jun; 6(1): 257–260. Zhou A, Young D, Vingan H. Uterine artery embolization for cervical ectopic pregnancy. Radiol Case Rep. 2015 Dec; 10(4): 72-75. Shoutout to resident physician Will Galvin who managed this case in critical care! Check back for the next Clinical Image of the Month.